The farmers of Les Garrigues are no longer cultivating some 36 per cent of the available farmland according to data from the Department of Agriculture. Les Garrigues has a total of 80,294 hectares of cultivable land of which 28,889 are not exploited, constituting an important factor in the increasing erosion of the soil. One of the causes of this situation are the low profits gained from cultivation in the unirrigated zones, a result according to the farmers, of a difficult climate and the lack of irrigation infrastructure. Twentyfour of the Les Garrigues municipalities have all their land under irrigation, four have land partially irrigated, while the rest are unirrigated. The irrigated areas are on the periphery of the region, in the districts of Segrià, Pla d'Urgell and Urgell. In total, the region has 8,171 hectares of farmland in areas with available irrigation, with 72,121 hectares unirrigated. This situation has a significant impact on the economy of the region, where there is a strong dependency upon olive and almond cultivation - crops that are well suited to the adverse climate. The olive oil produced is of the best available, linked to the fact that virtually all olive cultivation takes place in the unirrigated zones. 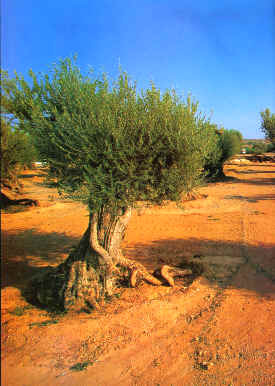 Faced with limited yields, farmers have specialised in the arbequina olive, focusing on quality rather than quantity. This olive has an oil that does not surpass 0.2 degrees of acidity, and is becoming one of the most appreciated of the world-wide market. The economic situation in recent years has deteriorated, with 12 million Euros wiped off the value of the olive oil harvest. In addition, the almond crop has suffered from repeated frosts, with practically total harvest losses. Farmers have been unable to insure against these losses.